The Hague-based intergovernmental Organization for the Prohibition of Chemical Weapons (OPCW) is mandated “to implement the provisions of the Chemical Weapons Convention…to achieve…a world…free of” CWs. Its mission includes “credible and transparent” on-site inspections to verify use of or destruction of these weapons. In 2013, it was awarded the Nobel Peace Prize for its work – given nearly always to establishment individuals, groups or other entities – with rare exceptions. Notorious laureates include Obama, Al Gore, Jimmy Carter, Kofi Annan, Yitzhak Rabin, Shimon Peres, Menachim Begin, the 14th Dalai Lama, Elie Wiesel, Mother Teresa, Henry Kissinger, the EU, and last October to narco-state terrorist Colombian President Juan Manuel Santos – among many other deplorable honorees. On June 30, the OPCW issued a “fact-finding (sic)” report on alleged use of CWs in Kahn Sheikhoun, Syria on April 4, 2017. Its so-called “rigorous methodology” was deeply flawed. 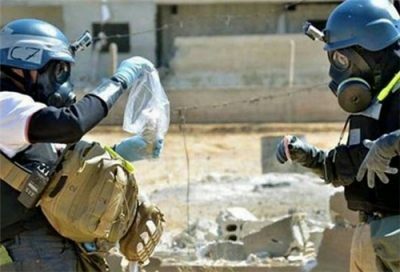 Alleged evidence lacked credibility – obtained from anti-Syrian sources, including the al-Qaeda-connected White Helmets. According to Shulgin, the OPCW’s fact-finding mission (FFM) “was unable to implement a complete chain of custody…for samples from source” – rendering so-called evidence virtually worthless. “The report leaves many important questions unanswered” – including no evidence that a CW attack occurred. The alleged Khan Sheikhoun incident is another “attempt to topple the Syrian authorities, to demonize President Assad. We have witnessed this policy (numerous) time(s) (before), and it is yet another example of such policy” – instigated by the West. Nothing proves Kahn Sheikhoun residents were victims of sarin or any other CW. The agency’s report lacks credibility – perhaps to be used as a pretext for escalated US aggression.